My first dessert post! Those who know me personally will know that posting a dessert this late in the game is surprising. I was a baker before I was a cook. There’s comfort in knowing that as long as you measure and follow directions accurately, there is no way you can mess up baking. In any case, I still love baking but living alone doesn’t offer itself to the opportunity to bake too often. When I have a craving, I want a piece of cake or slice of pie- not a whole dish. 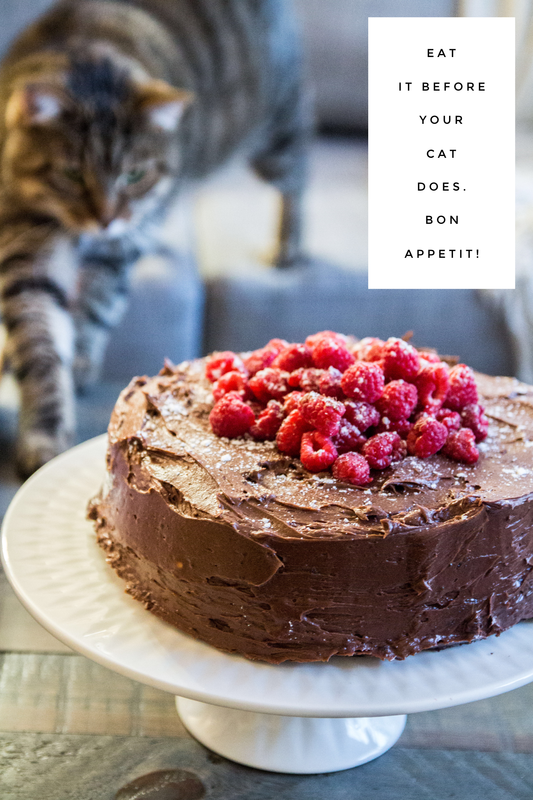 So when it was my turn to host book club, and our trio happened to be celebrating a new job; a job promotion and a PHD comprehensive exam over and done with… AND It was Atticus’ birthday the next day… I couldn’t pass the opportunity up. This recipe is adapted from the cookbook “Three Times a Day” released by Montreal-based blogger Trois Fois Par Jour. Her recipes are simple, tasteful and beautifully photographed. I have made so many recipes from this cookbook and I have yet to be disappointed. You’ll notice that the ingredients called for in this particular recipe are down-right disgusting. In fact, I almost want to make step 1 include “don’t think about the ingredients. Just close your eyes and toss them in.” If I could only convince you how incredible and moist this cake turns out being, you will happily include the indulgent ingredients. To me, I don’t like taking healthy shortcuts for desserts. You are already exercising portion control (hopefully) so why not make that portion as delicious as possible? 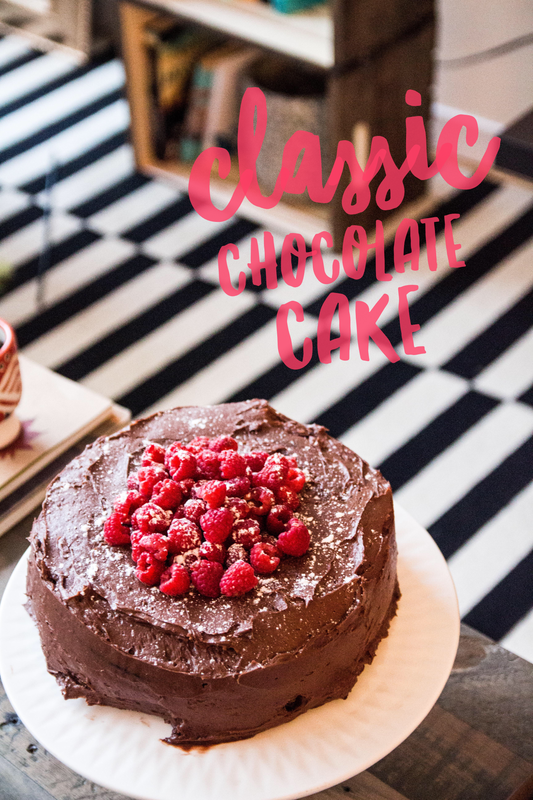 So enjoy this lactose full, sugar loaded, glutened, incredible chocolate cake! As with all other recipes, when your product has a key star, you must make sure that key star shines. In this case, it is imperative that you veer away from the $3 tubs of cocoa powder and invest a little bit. Trust me- though it will be pricy at first, a good tub of cocoa powder will last you through several chocolatey desserts and will elevate your baked goods from ‘good’ to ‘incredible.’ I like using the Camino brand of cocoa powder. It is fair-trade and high quality, but I would also recommend Ghiradelli’s. This is a very, very rich and moist cake. It is heavenly but can be a but much on its own. I always recommend serving cake with a side of milk, because I’m a child at heart, but I truly do recommend pairing this with some berries on the cake itself, and also on the side. The pairing is incredible and adds a burst of freshness to a very decadent cake. Preheat oven to 350F. Butter 2 9-inch springform cake pans and set aside. 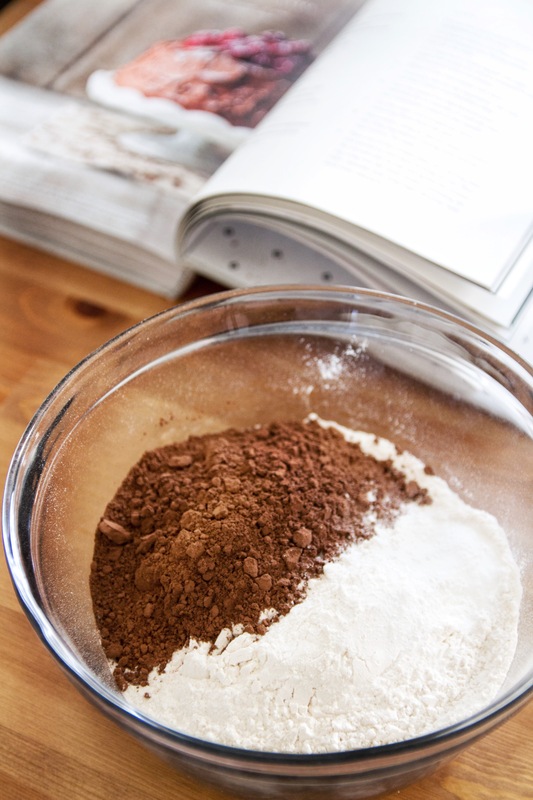 In a medium sized bowl, combine the flour, cocoa powder, baking soda, baking powder and salt. Set aside. In a large bowl (I used my Kitchenaid mixer) whisk together the eggs, sugar and vanilla. If you are mixing by hand, about 3 minutes. If you are mixing with a stand mixer, about 2 minutes on medium speed. Ensure your mixture is foamy. Add in the mayonnaise and water and whisk until incorporated. Add in your flour mixture gradually until well incorporated. Fold in the dark chocolate chips. Pour the batter evenly into the two greased pans. Bake for 30-35 minutes. Let cook completely before removing from pans. While your cakes are resting, make the icing. 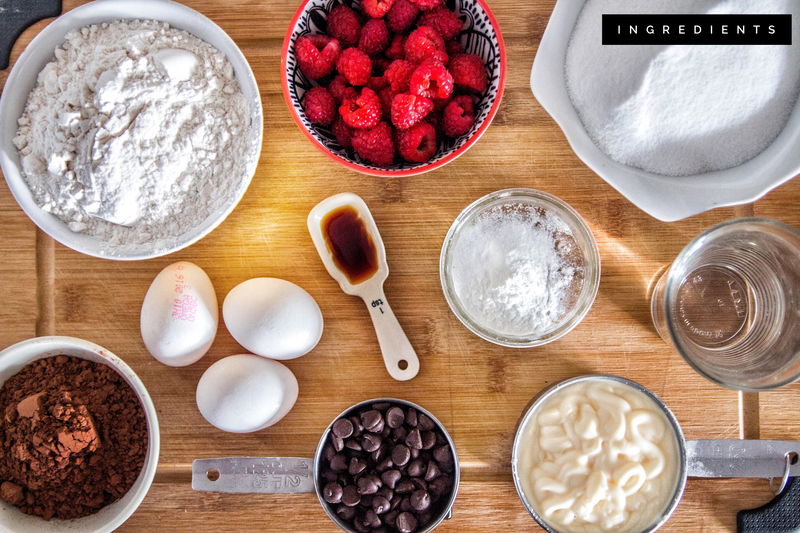 Use a stand mixer to combine all the icing ingredients with a paddle attachment (about 3-5 minutes). 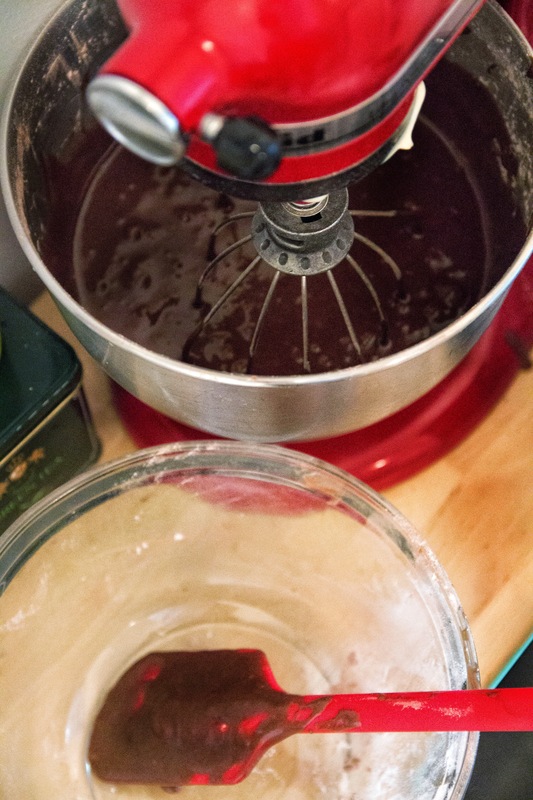 If you don’t have a stand mixer, use some elbow grease and stir until well incorporated. Or use an electric egg beater. 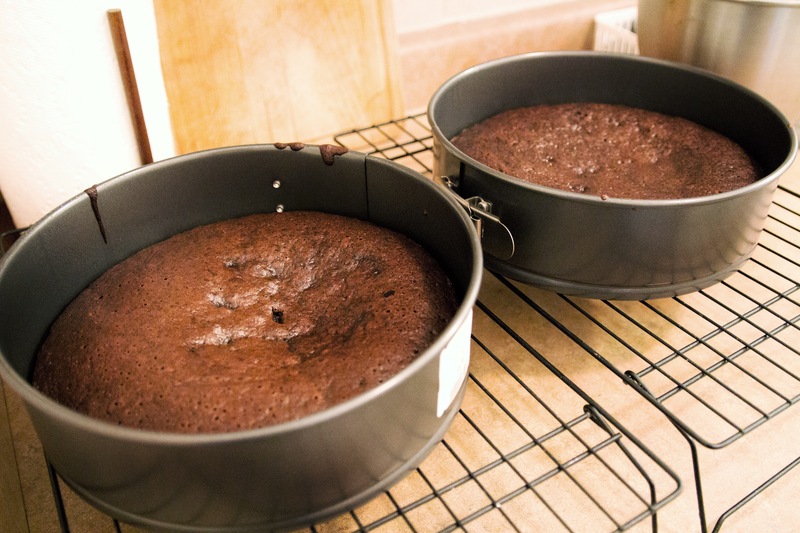 Once cakes are cooled, place one on the serving plate, spread an even layer of icing on top, and then place the second cake on top. Cover the entire cake and sides with the icing and spread evenly with a cake spatula. Cover the top in berries and sprinkle icing sugar on top for decoration. Enjoy! How have I not seen this comment until now!? Thank you so much! That is so kind of you! Ah you made my day! Haha you’re welcome! And you deserve it, you have a fantastic blog!